When we think of a process to make a product or service, we must be concerned about various settings. The settings are important because they control the process to ensure quality and consistency in what is produced. If settings are absent or incorrect, the process is uncontrolled produces bad results – defects, scrap, customer complaints, etc. If we think of Lean transformation as a process, then we begin to realize that there are several critically important settings associated with that process. 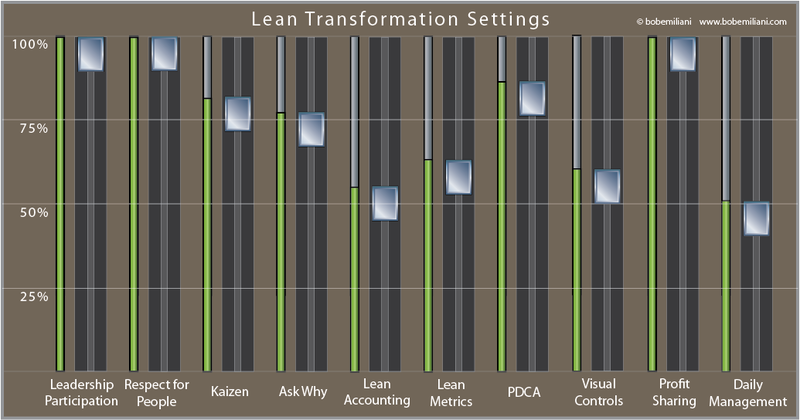 If we want good results with Lean management, we have to pay very close attention to the settings. Leaders must accept that Lean management requires them to learn and do new things, and that this can only be achieved by their direct participation in continuous improvement, followed by the application of what they learned to their own leadership and daily management processes. Leaders must also accept that they do not yet understand the “Respect for People” principle and how this enables continuous improvement. Therefore, they must begin with this principle as the foundation for everything to come. Kaizen, a derivative of the Scientific Method, must not be seen as an event, but instead seen as a daily activity that becomes more widespread over time as people learn what kaizen is and how to do it correctly. The organization must transition from standard cost accounting to Lean accounting, to assure that improvements help achieve flow and that financial decision are consistent with Lean principles and practices. Metrics that are consistent with Lean principles and practices must begin to replace those that are not (or, de-emphasize their importance in decision-making). Everyone (top to bottom) gets trained in the PDCA cycle, also a derivative of the Scientific Method, and evidence of its effective use grows over time. The organization must begin to establish visual controls in the shop and office, and concurrently develop visual controls for daily management and strategic leadership processes. Quarterly profit sharing is established as an incentive for people to participate in improvement and make rapid progress. It also signals a re-orientation of management attitude from zero-sum (win-lose) thinking to non-zero-sum (win-win) thinking – meaning, enlarge the pie for all stakeholders (employees, suppliers, customers, investors, and communities), and thus abandon traditional fights among stakeholders over the size of their slice of the pie. Leaders at all levels commit to the practice of daily management (standardized work) routines. Some settings are preset to the maximum, while other settings start low and increase over time as learning and experience accumulate. Be careful. Don’t listen to people who tell you to ignore the settings. Wrong settings, wrong results. Instead, learn from those who learned their Lean management lessons well and who know what they are doing. These are the settings that are required for good results. The settings are what my six-volume REAL LEAN book series is about. It is a detailed explanation of the economic, social, political, and historical settings that are need for Lean transformation success. If you don’t have the time to read these interesting and engaging 1,098 pages that relate directly to your job as a leader, then have a look at Moving Forward Faster, which in only 41 pages summarizes the economic, social, political, and historical settings presented in the REAL LEAN book series.